“I like the unexpected, I want to take small things and make them impactful”. In person Michelle’s friendly, bubbly laughter fills the room with positive energy and her enthusiasm for creating art makes it impossible to not feel suddenly inspired to create art in her presence. Her personality extends into the work she produces, her designs literally fill rooms with fun and unexpected charm. Whether it’s hand-made painted boats floating along the ceiling for a CreativeMornings Summit, 10,000 printed photos hanging from the ceiling for a transformative installation for a Google press event or creating interactive, quirky backdrops for a pizza themed YouTube party. The creative flexibility of event design satisfies her hunger for learning and experimenting. Her background in installation and craftsmanship supports the multi-faceted nature of event design and uniquely positions her to be able to create hand-crafted, extraordinary projects for her clients. Success in large-scale event design involves a surprising amount of calculation, such as knowing exactly how many days it will take to make and hang 2,000 paper cranes. It not only involves the creative/art-making aspect but also planning, prototyping, budgeting. Throughout her early freelance career she struggled to understand what type of work ignited her passion and what sort of career fit with her artistic passion and adventurous personality; which she jokingly refers to as her own brand of weird. Even when some jobs weren’t the best fit or left her feeling unfulfilled, she initially put pressure on herself to make it work. Despite the uncertain journey, throughout all these jobs she was unknowingly building the variety of skills needed to launch Hell Yes Design Studio in 2014. She realized how much joy she found in being a maker and created a business around her skills rather than trying to fit her skills into a certain mold. 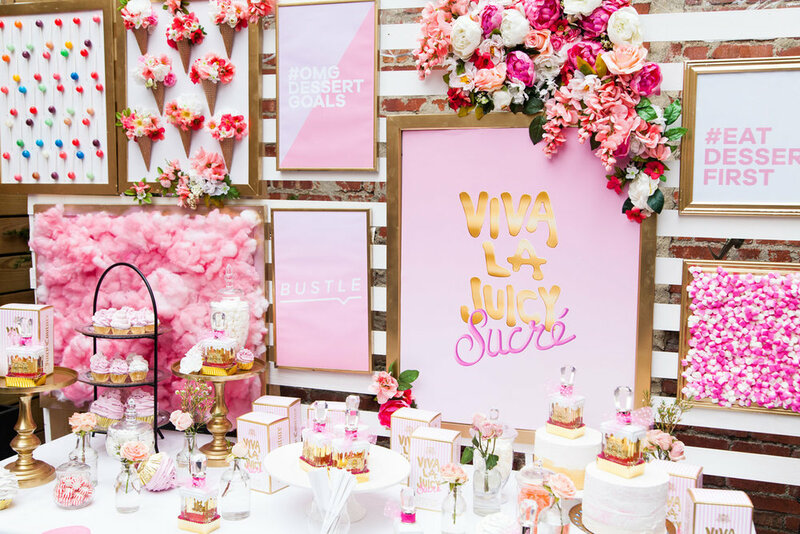 I recently attended a dessert festival for which Michelle designed a floral and dessert themed display for a Juicy Couture perfume bar. It involved a wondrous entrance of fluffy pink paper flowers, faux cakes and frosting topped cupcakes that looked good enough to eat. As I watched a group of friends at the photo-booth giggling and posing with Michelle’s hand-crafted props I realized that one of the most beautiful aspects of Michelle’s art is the kindness and delight it imparts. Her positivity is a power that transforms the atmosphere of spaces. In today’s world art that brings people together is truly special. Our visit to her studio, situated in a former glass factory in Brooklyn, reveals a creative maker space with positive vibes. Craft supplies are neatly organized on peg boards, larger items such as hand-made piñatas and bins of colorful pom-poms are tucked away in a storage room with a sign over the door that reads ‘Babe Cave!’. Positive messages and quirky artifacts are scattered about, a You Look Great Today sign hangs next to a row of a paint brushes and a pair of miniature pink flamingos watches over her desk. When I comment on the coffee mug sheʼs drinking out of; big gold words BOSS emblazoned across, she smirks and laughs at the absurdity of it. She is the total opposite of the typical idea of a boss. Having experienced working for many ʻbossesʼ in the beginning of her career, Michelle knew that she wanted the internship program she created for her business to be positive and 100% educational. She greatly enjoys teaching new skills to her interns and encouraging them to make mistakes, as she believes it only leads to wonderful things in the end. She exclaims. In return she says having interns on board have added joy and structure to her work and many are hired on after as freelancers. Michelleʼs career path has been uniquely non-linear. At Northeastern University she majored in film and literature and was interested in making music videos. After school her career path twisted through a rainbow of experiences as she searched for what it was that made her truly happy/passionate enough for to make a living from. This included gigs as a DJ, selling vintage on Etsy and hand-made goods at craft fairs, studying floral design, freelance sewing and crafting for tv productions and window installations for Anthroplogie.